If you have a leak under your shower door, you probably need to check the area in between the door and the threshold. Chances are, the shower door sweep is gone or damaged. 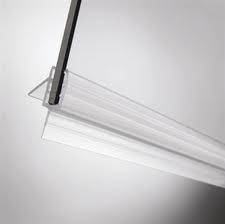 A shower door sweep is simply a strip of flexible rubber that covers this area and prevents water from escaping through the gap. These can get warped from rubbing on the threshold or completely fall off of the shower door. Some sweeps are held on with screws and others are caulked into place. The trick is to find the style that you have and replace it. Some sweeps slide along a rail, but you have to get the right one to fit. If you have the old door sweep, you can take it with you to get a match. Try a home center first, and if they don’t carry it, go to a glass company that installs shower doors. If they don’t carry it, they can order it for you. Reinstalling the new sweep with either involve sliding it back into place, caulking it, or screwing it back on to the bottom of the door. By the way, letting water leak out here for too long can result in some large expenses. We recently had a customer that let this go on too long and he eventually had to have some remediation done from the water damage. Many people have problems with a leaking shower head. The big issue is if the shower head leaks when the shower is on or off. If the shower head leaks when the shower is off (that is to say the handle(s) are in the off position), then the problem is not with the shower head, but rather the shower valve. Typically a part in the valve needs to be replaced. Here are some hints on how to replace a shower cartridge, which will work for a single handle shower valve. If the shower head leaks when the water is on, the problem is with the shower head itself, or, most likely, where the shower head screws on to the shower arm. If this is your problem, unscrew the shower head from the arm and wrap the threads three times with Teflon tape. Once you snugly screw it back together, the Teflon tape should prevent leaks at the threads. It may also be that the shower head is damaged. Many homeowners, when installing a shower head, will overtighten the connection which can crack it, causing it to leak. Lastly, there is a washer inside the connection that seals the water from leaking out. It may be that the washer is damaged or slightly twisted. Try prying it out with a standard screwdriver and then flip it over to give you a new surface to screw against. If your shower head has a lot of scale and mineral deposits you can soak it in a product such as "CLR" or even warm water and vinegar. A leaking shower is enough to make you pull your hair out. Typically, the cause is a shower cartridge. A shower cartridge is about the size of a roll of nickels, and has holes and rubber washers all around it. It is located in the shower valve, which is in the wall, but it is easy to access. It will take about 30 minutes to fix, but will save lots of water as a result. If you have to pull out the knob to start the flow of water, the replacement cartridge will cost about $20. If you simply turn the knob from side to side, the cost is about $45. You can find replacement cartridges at most home centers, but if they don't have your particular type, try a plumbing supply store. Now, let's get to the repair. First, shut off the main water supply to the house. Open a faucet to let out the water pressure, then move to the shower. Using a small, standard screwdriver, gently pry off the shower knob cover. Under this cover is a screw that holds the knob onto the cartridge. Remove the knob. Next, you'll find the valve body, which covered by a decorative escutcheon. Remove the escutcheon by gently pulling it straight out. A retaining pin holds the cartridge in the shower body. This pin will have a nub sticking out of the top of the shower body. Grab a pair of pliers and pull it straight up. The only thing left to do now is remove the actual cartridge. I recommend that you get your hands on a cartridge remover, which costs about $10. You also can try your luck with pliers, however, the cartridge- removing tool is made just for removing cartridges. Place the larger, hollowed end of the cartridge remover into the shower body and over the old cartridge. Tighten the screw on the end of the tool. This screw fits into the hole where your shower knob was, and it locks the tool into the cartridge. When the ears of the tool are engaged with the ears of the cartridge, turn the tool (and consequently the cartridge) to break the cartridge free from years of torment. The cartridge will pull straight out. Install the new cartridge simply by pushing it into the shower body with the ears in the 12-and-6 position. Push it in far enough so that when you replace the retaining pin, it slides completely into place and locks the cartridge in place. Next, turn the water back on and make sure there are no leaks. Replace the escutcheon and the handle. Now, test to make sure that the hot water side is hot and the cold water side is cold. All you need to do is remove the shower knob, take a pair of pliers and rotate the stem (the part of the cartridge that the shower knob screws into) 180 degrees. The cartridge stays put, but the stem is free to rotate. It's the knob and the escutcheon that restrict the movement of the stem. I'm amazed at the number of people who believe this reversed-temperature problem means that they'll have to re-plumb their shower. Maybe the next time someone presents this problem to me, I'll grimace, shake my head, and ask them for a calculator. Once I see the sweat pouring from their heads, I'll let them in on the easy fix.